Total Area: 3842 Sq. Ft. 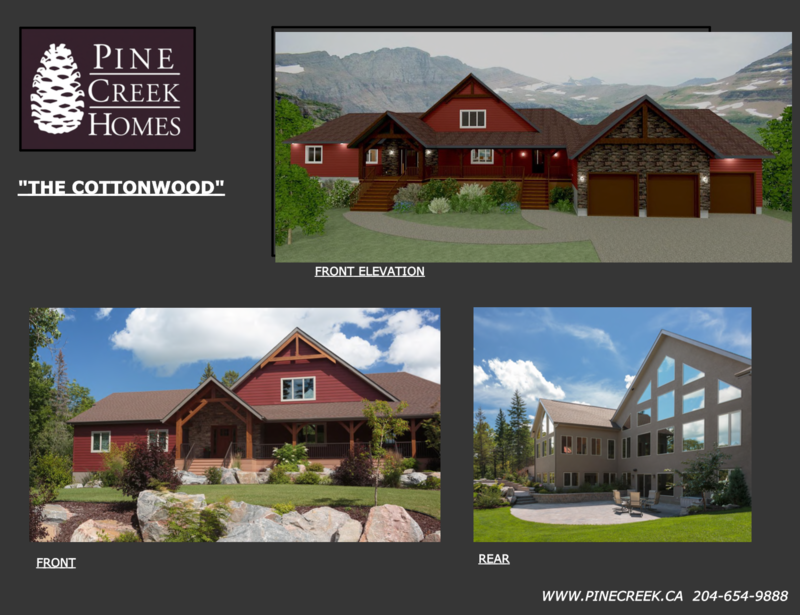 This 3,842 square foot hybrid timber frame bungalow, literally has space everywhere. The timber frame covered entry and deck give the curb appeal a rustic country feel. Immediately as you walk in, you’ll notice the 24 foot vaulted timber frame ceilings, that bring the outside in. Walking through the spacious entry into the great room, you’ll instantly see how this home brings the rustic feel from the outside in, with windows from wall to wall, along the vaulted back of the house. Having that much natural light in the great room really accentuates the wood beams in this home. The size of the kitchen in this design matches the rest of the home. With endless counter space, and two islands, one with a prep sink and the other with space for bar stools, this kitchen will handle whatever you throw at it, especially when entertaining. The dining area also has some extra built in space that allows for a larger table for more guests. A walk-in pantry is situated between the kitchen and the mudroom to make it easy to bring in groceries, as well as access them from the kitchen. The bedrooms in this design carry on with the spacious feel of the rest of the home. The master bedroom is huge, with it’s own built-in entertainment unit, and a space for furniture to enjoy the view of the back yard (imagine a little reading nook?). Walk-in closets are on either side as you walk into the ensuite. Dual sinks, a private toilet room, a jacuzzi tub and a custom shower, really give this ensuite a luxurious feel. The remaining three bedrooms all have their own walk-in closets and plenty of room for additional dressers or a desk for kids to do homework. With all of the open space in this plan, the family room and sunroom are great spots to get some peace and quiet. With windows all the way around, it doesn’t matter which way the sun is or which way the breeze is blowing, you can always get some great fresh air and sunlight in these spaces. The oversize triple garage in this design has all the features you could want – plenty of space for cars and storage, an auxiliary overhead door out the back for lawnmower access, and stairs straight down into the basement. Walking into the main floor from the garage finds you in a spacious mudroom with plenty of bench and coat hook space for jackets and shoes. Before you enter the great room, you’ll notice the main floor laundry and a washroom, that is easily accessible from the garage entry. Lastly, and one of the most important things to note about this and all of our other plans, is that these designs are simply meant to provide you with ideas for a starting point. 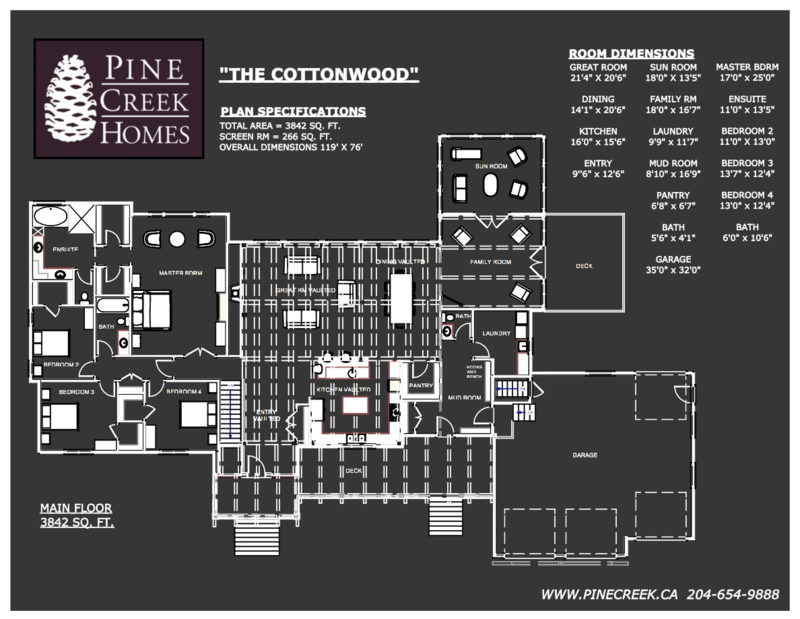 Every home we build has its own custom plan, and we never build the exact same house twice. So, if you see something close to what you like, we can use that as a starting point, or if you don’t see anything you like, feel free to come sit down with us and we can draw you your own custom plan from scratch. We look forward to hearing from you!